Successfully Added Dual Camera Mini Car DVR with LCD Display (Night Vision, Free 4GB TF Card) to your Shopping Cart. How can you prove the other guy is responsible for the traffic accident if you don’t have a video recorded? For you this dual camera mini car DVR will be better than ten traffic lawyers: with two camera lens to record what happens both inside and outside the car, it not only captures what the other guy did to you, but what you did actively in order to avoid the accident. With this product, you will have a clear and detailed video that you can proudly present in your defense and put the blame on the bad guy. It would also be useful for these situations: recording evidence that you are abused by a traffic officer; life blogging – recording simultaneously both the beautiful scenes outside and the happy faces inside; driving attentively while still keeping an eye on the kids sitting in the back. With its ingenious dual camera design, the possibilities are simply boundless. It’s easy to set up too. Simply hook up to the mounting plate, attach it to the windshield and you are ready to go. Just press one button and it will start recording. What’s best, it comes with a USB cable and a cigarette car charger for you to charge and continue recording, anywhere, anytime. Don’t worry about running out of storage too – the included FREE 4GB microSD card is enough for you to store tens of hours of video! 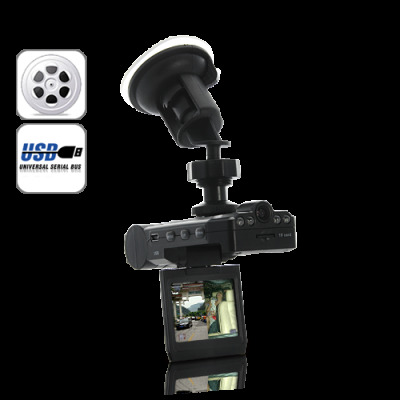 This multifunctional Dual Camera Car DVR is now offered at an incredible wholesale price. Great both for personal use and selling online, it’s now in stock for immediate shipment. Order today and get your order within a week anywhere in there world. Available from your source for high tech electronics, Chinavasion. Recording evidence to protect yourself. Easily mounted on the windshield. Display and camera lens rotatable.